With the weather taking a turn towards Winter we decided it was time to start roasting root vegetables. Reduce oven temperature to 130'C and leave oven door open until temperature has dropped. Continue to roast pork for a further 90 minutes. Cut the root vegetables into large wedges and slice the leeks diagonally with a thickness of 1-2cm. Place the leeks in a pan with a good sized knob of butter and season with salt and pepper. Heat until butter has melted and then cook for a further 3-4 minutes. Stir so leeks do not catch. Once done place the pan of leeks to one side. After the pork has been cooking for 80 minutes, put the root vegetables on to steam for around 10 minutes or until they are tender, but not falling apart. 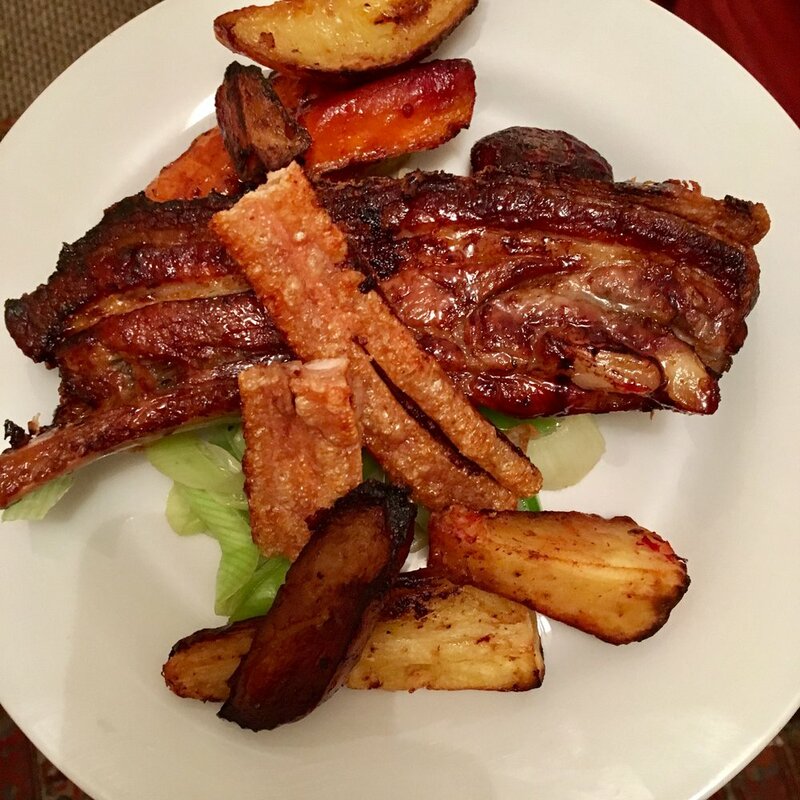 When the root vegetables are almost steamed, take the pork out of the oven and carefully remove the crackling and set both pork and crackling to one side. Once root vegetables are lightly steamed tip these into the roasting dish which had the pork in to utilise the pork fat. Place into the oven and increase the temperature to 220'C. After 10-15 minutes when they start to look golden, place the pork into the roasting tray alongside the root vegetables and glaze the pork with honey. Place back in the oven until the pork is golden and crisp, but not burnt. When the pork and root vegetables are ready, warm through the leeks and plate up on a bed of braised leeks, topped off with the crackling.